More more people are realising the benefits of having straighter teeth, not only to the way they look but also making teeth easier to clean and therefore keep healthy. With modern lifestyles it’s becoming increasingly common to want to have orthodontic braces as quick as possible, without having to wait months or even years for the result. As an Invisalign approved provider we are proud to introduce you to Invisalign Go, the fast braces system for rapid results in Harrow. Am I suitable for Invisalign Go? Quick results can be achieved with this system because we are only attempting to move the anterior (front teeth). It is typically these teeth in the aesthetic zone of your smile which have the largest cosmetic impact on the way you look. By just focusing on these teeth, which have smaller roots and therefore move quicker, we can achieve straighter teeth quicker than many other systems. So are you looking to straighten your front teeth only? Then you may be a candidate for Invisalign Go. The average treatment time is 7 months, this means your individual treatment could be slightly less or possibly slightly more. If you wish to straighten both the top teeth and the bottom teeth this can be done at the same time and need not necessarily lengthen the treatment time from having one single arch only treated. How will I know if these braces will work? The beauty of using Invisalign is its ability to track and plan your progress. You will typically have review appointment every 8 weeks and you will be changing your fast aligners every 2 weeks. It’s also possible for us to take digital photographs of your teeth and compare them against the digitally produced treatment plan which is done right at the beginning. The digital treatment plan before you start treatment will work out where your teeth should be at any stage throughout the process, we can then use ongoing digital photography to compare progress against the plan. Revolutionary! What does Invisalign look like when being worn? Because Invisalign Go uses clear aligners they are almost imperceptible and virtually invisible. Take a look at the image here, if you look extremely closely you can just about see the edge of the Invisalign braces around the gum margin of the teeth in the image at the front. Invisalign really is virtually imperceptible in normal everyday living. This means you can wear your clear aligners all day long with no one else knowing, a huge move forwards in orthodontic technology. How do I get started with Invisalign Go? The simplest way to get started is to request an appointment for a review, your dentist can then take a look at your overall dental health to ensure you are suitable for this type of rapid brace, digital photographs may be taken as well is impressions which can then be used to create your digital plan treatment. 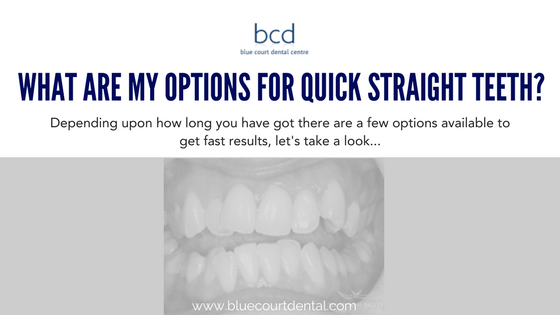 This entry was posted in Dentistry, Orthodontics and tagged Invisalign Go, Quick braces, Quick orthodontics, Quick straight teeth, Quick teeth straightening on 15 June 2017 by Dr Nishan Dixit.